When logging into Chase Bank, through the secured link in 1Password, I receive the error message, "your browser is out of date". They provide a link to four browsers, including Safari. I am using an iPad and of course cannot do this. However, when I attempt to log in to Chase Bank, outside of 1Password, using Safari, I am able to successfully log in to Chase Bank, with no problem. This is puzzling, since I am able to log into my other bank accounts, through 1Password, using the secured Chase link, without problems. Addendum for blueumbrella: I use iPassword Professional, updated to latest version. Thank you for the information. I was successful in enabling the extension, and even added a website. Very clear and easy to follow instructions! Much appreciated. I will now try to log into the bank account. Thanks for the feedback and kind words, @blueumbrella. If we can be of further assistance, please don't hesitate to contact us. This just happened to me too. Chase Bank, go update your browser. From within 1P app on iOS (most recent), iPad Mini 4. I have logged in successfully on computer using 1P, and on iPhone within 1P app, definitely within the past 48 hours, so this is new. I can manage; just letting you know. Please let me know how that turns out. 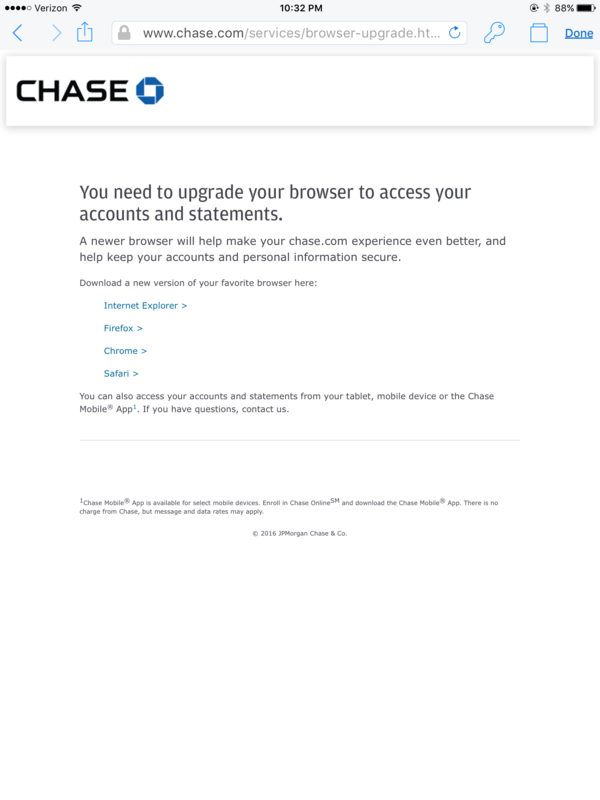 Chrome works (www.Chase.com hasn't worked with Firefox or Safari for over a year now). Yes, the 1Password extension on Chrome works. If it doesn't work in Safari on iOS then we almost definitely can't make it work in 1Browser (the browser built into 1Password). 1Browser uses Apple's WKWebView API for ... well, the "browser" part of 1Browser. WKWebView is basically just watered down Safari. 1Browser is mostly a holdover from before we were able to have an extension in Safari itself, and as such most of our browser based development effort on iOS is focused on the extension now. Glad to hear the extension + Chrome allow you to login. You may also want to look into the Chase app. They haven't implemented 1Password support yet, so you'd have to copy & paste your password. With iOS 9, at least on iPad, Slide Over makes this fairly painless.